Preserved bodies found in countries around the world can be divided into three classifications: the deliberately preserved, the accidentally preserved, and the incorruptibles. Specimens of the accidentally or naturally preserved were found even before Egyptian Pharoah times, when the art of embalming originated, producing for the first time the deliberately treated mummies which have survived for as many as three thousand years. The incorruptibles, however, have existed only since early Christian days. ⇾ 1. Accidentally preserved - These type of preserved bodies were determined to be preserved due to accidental means such as having been buried in dry, hot sand, or lava, or having been placed in an area with high radioactivity. As long as air or moisture did not reach these bodies, they can many times be preserved from significant, but not total decay. However, when accidentally preserved bodies are discovered, they are typically discolored, wrinkled, distorted, are skeletal looking and have no elasticity. In addition they always have a bad odor and always decay rapidly once bandaging is removed for scientific examination. ⇾ 2. Deliberately preserved - Deliberately preserved corpses are those that were purposely embalmed or otherwise treated before burial with the intention of trying to prevent decomposition. As long as air or moisture did not reach these bodies, they can many times be preserved from significant, but not total decay. In most older cases of deliberately preserved human bodies discovered, the body cavities were filled with specific materials like resin or resin-soaked sawdust, or the entire body was submerged in specific materials such as honey, rum, or sand. In more modern methods of attempting to prevent corpse decomposition, the body was typically submerged or filled with resin, tar, salt, alcohol, or a combination of these. Again, when deliberately preserved bodies are discovered, like accidentally preserved bodies, they are typically discolored, wrinkled, distorted, are skeletal looking and have no elasticity. In addition they always have a bad odor and always decay rapidly once bandaging is removed for scientific examination. Their preservations since that time have challenged the opinions of skeptics and contradicted and defied the laws of nature, all to the dismay of many examining physicians and the admiration of succeeding generations. The more carefully we consider the preservation of the incorruptibles, the more baffling does the subject become, for their conservation seems to be neither dependent on the manner of burial nor on the temperature or place of interment. Nor were they adversely affected by extended delays between the time of death and their burials, by moisture in the tombs, by rough handling, by frequent transferences, by covering with quicklime, or by their proximity to decaying corpses. The greater majority were never embalmed or treated in any manner, yet most were found lifelike, flexible, and sweetly scented many years after death, in sharp contrast to the specimens of the other two classifications above, who, without exception, were found stiff, discolored, and skeletal. The mystery of their preservations is further compounded by the observance of blood and clear oils—which have proceeded from a number of these holy relics—a phenomenon which again, needless to say, was never recorded with regard to the deliberately or accidentally preserved. Through history, the bodies of a considerable number of deceased Catholic Saints and other blessed persons, have not undergone the normal processes of disintegration. Without any kind mummification or embalming methods, their corpses have thus remained incorrupt, a few even after 1500 years. The accounts of incorruptible bodies are a part of Christian history from the first century right through to the 21st. Many of those, whose bodies have been found incorrupt, had died either by violence or diseases, conditions which normally would encourage the disintegration processes rather than preserve the bodies. Some had been buried in close proximity to other bodies that decomposed normally. Some had been consigned to the bare earth. Others survived burial in such damp conditions that their clothes rotted off their intact bodies. Some had been lying in lime, water or left in the open. But apparently unaffected by exterior influences, the bodies were found preserved as if they were still alive. From the beginning, the phenomenon was seen as tangible proof of the sacredness and purity of a saint. 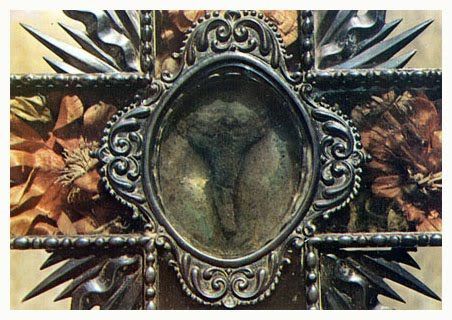 The incorruptible bodies were therefore not buried but placed into sumptuous reliquaries and exposed above or behind the altar for everyone to see. During the Middle Ages, churches that had one of these incorruptible saints became especially popular among pilgrims. It therefore became customary to exhume all candidates for beatification and canonization (the various steps on the way to sainthood). 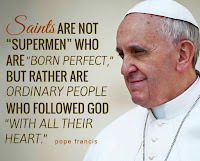 Because of the Vatican’s quite strict canonization process, these exhumations have usually been witnessed with oaths and affidavits by ordinary working people as well as respectable doctors and medical specialists. The phenomenon is therefore among the most thoroughly documented of all alleged miracles. Disregarding the irrational elements and proven frauds, there is enough evidence of remarkable occurrences surrounding the incorruptibles to take the phenomenon seriously. It hasn’t been systematically examined by science and no rational explanations have yet been offered. 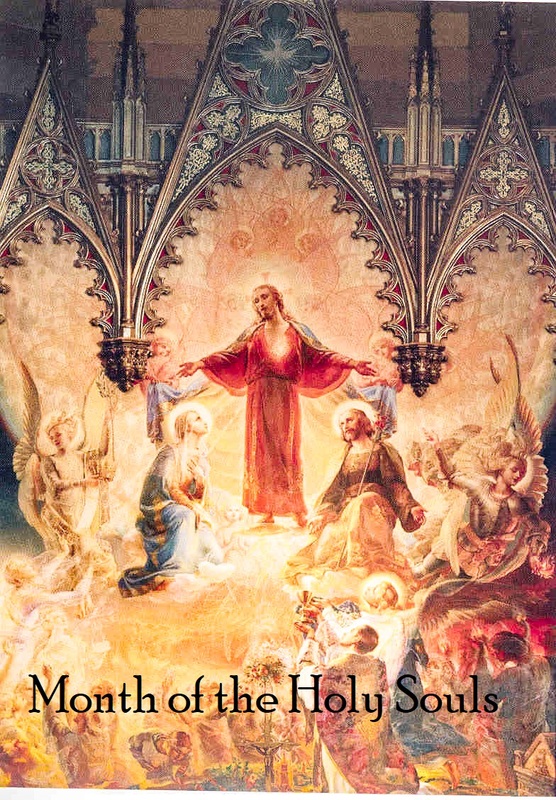 The devout therefore continue believing that the bodies of these individuals have been miraculously preserved by God because of their sacredness and purity - as a reminder of their wonderful deeds. Other supernatural characteristics usually related to incorruptibles are: an absence of rigor mortis; a persistent pleasant fragrance emanating from the body; in rare cases a bleeding long after death (from stigmata wounds or injuries suffered in martyrdom); in a few cases bodies have been warm long after death; even more rarely there has been some kind of ritualized movement of the limbs (for example, giving a blessing or even talking), which cannot be accounted for by mere contraction of muscles. Secret or long-forgotten burial places of incorruptible saints have often been revealed to the discoverers by dreams or visions. Sometimes the discovery has been caused by unusual noises or a strange light emanating from the burial place. Long-dead bodies, or their remaining parts, have sometimes exuded a fragrant, clear oil known as “Oil of Saints” or “Manna Oil of Saints”. 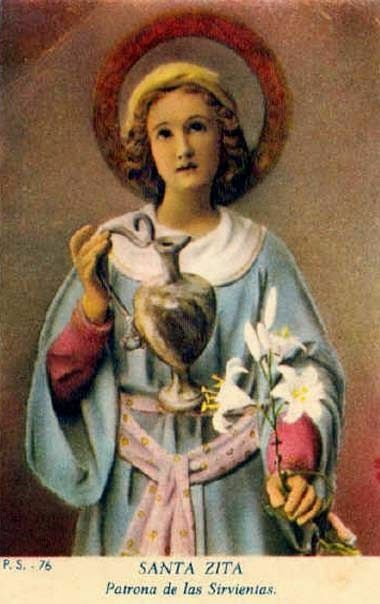 This liquid, as well as any relic related with the incorruptible saints, like blood or clothing, are usually attributed great powers of healing. Because there have been many impeccable accounts of incorruptibility, many presumed saints were exhumed and re-interred. It soon became the custom to exhume all candidates for beatification or canonization. 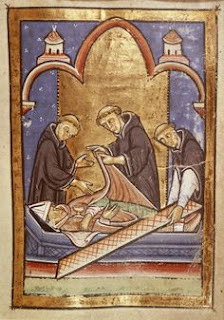 Throughout the Middle Ages, churches vied for possession of incorrupt bodies, as they were a proven magnet for pilgrims (who, of course, brought offerings and donations). Despite its damp climate, mediæval Britain has nurtured a good number of saintly characters whose bodies didn’t decay, including Cuthbert, Werburgh, Waltheof and Guthlac. Amongst them were two royal sisters (Etheldreda and Withburga), a king (Edward the Confessor), a bishop (Hugh of Lincoln) and an archbishop of Canterbury (Alphege). At the Reformation, all their shrines were destroyed and the incorrupt body parts dispersed. When her shrine at Ely Cathedral was destroyed, the saintly Queen Etheldreda’s hand was preserved by a devout Catholic family. The still incorrupt hand was enshrined, some 400 years later, when a little Catholic Church was re-established in Ely. An apocryphal story relates how the present Queen, on a tour of the cathedral, met the crusty Irish priest of the little Catholic Church. She asked him if it wouldn’t be a ‘nice gesture’ to return the hand of St. Etheldreda to the cathedral; he replied that it would be a nice gesture for her to return the cathedral to the Catholic church. The accounts of saints’ bodies not decaying despite being buried for years continue to the present day. The two most amazing modern accounts are of St. Bernadette and St. Charbel Makhlouf. 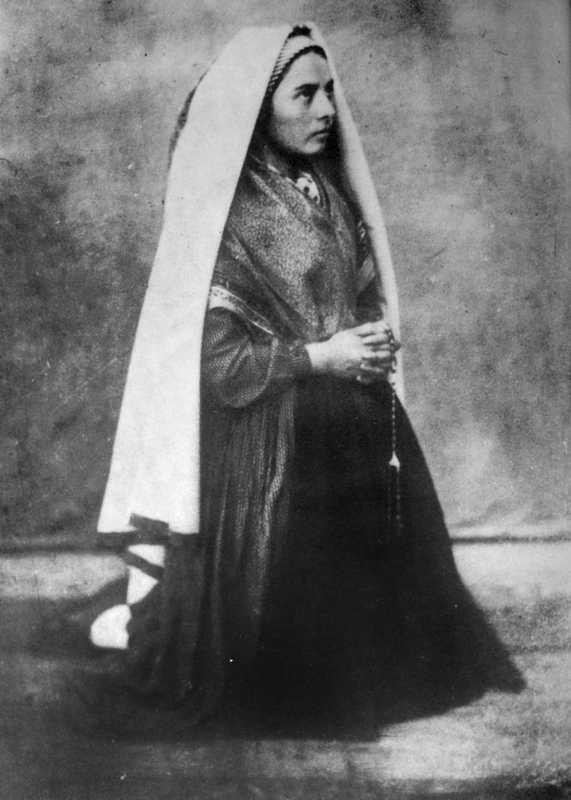 St. Bernadette was the shepherd girl who saw the Blessed Virgin Mary at Lourdes. She died in a convent at Nevers in 1879 and was buried in the chapel crypt. In 1909, a commission investigating her saintliness exhumed her body with the bishop and two doctors as official witnesses. They were joined by two stonemasons and two carpenters. All of them swore beforehand to tell the truth of their findings. 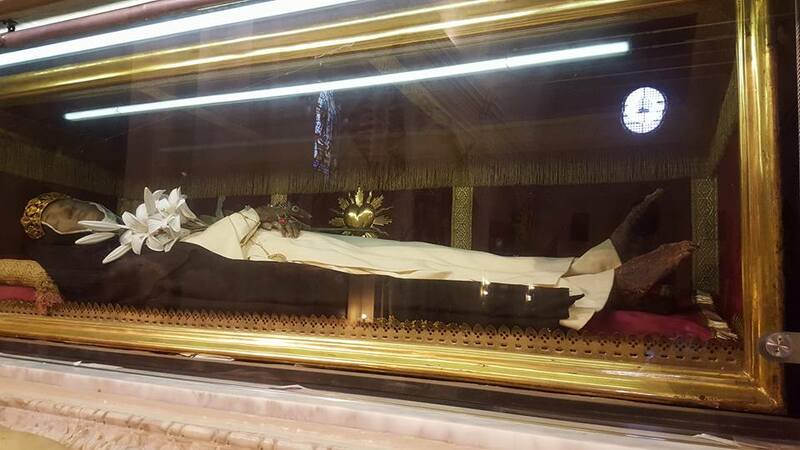 They found that the saint’s body was incorrupt. A nun who had witnessed the burial 30 years before noted that the only change was that the dead nun’s habit was damp. St. Charbel Makhlouf, who died in 1898, was a Maronite monk from Lebanon. In his life, he seemed unremarkable except for his quiet and intense devotion. After his death, for 45 nights, strange lights appeared over his grave. Because 45 days is the traditional length of time for a body’s decomposition, the monastic authorities called for his exhumation. His body was found perfectly fresh, despite the fact that recent rains had reduced the cemetery to a quagmire and the body was found floating in a muddy pool. Charbel’s body was re-clothed and transferred to a wooden coffin, but a strange blood- like “oil” kept exuding from his body… so much so that the clothes had to be changed twice a week. 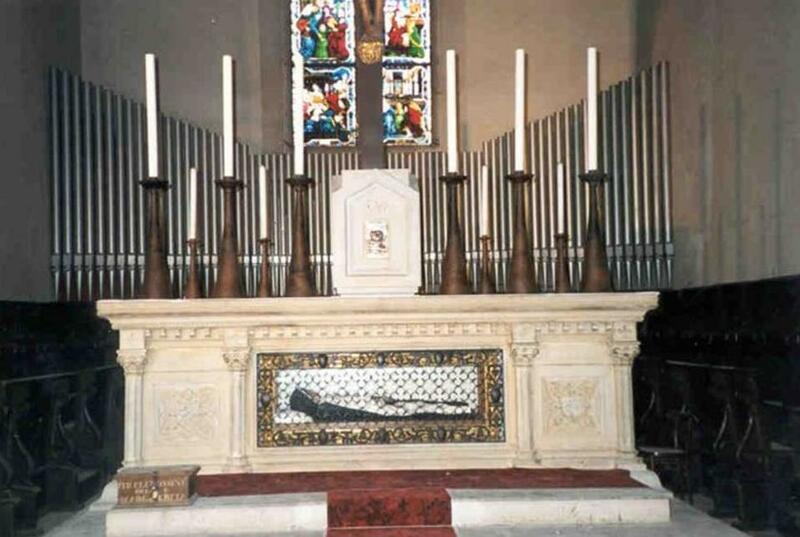 In 1927 – 29 years after his death – his still incorrupt body was examined and found to be totally flexible. It was then re-buried in a niche in the ancient abbey church. Pilgrims to the shrine in 1950 noticed liquid seeping from the tomb and the coffin was opened again. Incorruptibles are typically found lifelike, moist, flexible, and contain a sweet scent that many say smells like roses or other flowers, for years after death. Incorruptibles are almost never embalmed or treated in any way due to the religious order's beliefs that the person came from. Incorruptibles remain free of decay, some for centuries, despite circumstances which normally cause decay such as being exposed to air, moisture, other decaying bodies, or other variables such as quicklime, which is typically applied to a corpse to accelerate decomposition. Incorruptibles many times contain clear, flowing oils, perspiration, and flowing blood for years after death, where accidental or deliberately preserved bodies have never been recorded to have such characteristics. Other partial incorruptibles have been found throughout the centuries where certain parts of the body decay normally, while other parts such as the heart or tongue remain perfectly free of decomposition. The body was still incorrupt but exuding the peculiar oily sweat; many miraculous cures have been attributed to this substance. The body remained incorrupt for 67 years, finally decaying in 1965. Born into a humble family which little by little fell into extreme poverty, Bernadette had always been a frail child. Quite young, she had already suffered from digestive trouble, then after having just escaped being a victim of the cholera epidemic of 1855, she experienced painful attacks of asthma, and her ill health almost caused her to be cut off forever from the religious life. When asked by Monsignor Forcade to take Bernadette, the Mother Superior of the Sisters of Nevers replied: "Monsignor, she will be a pillar of the infirmary." She lived in the convent for thirteen years, spending a large portion of this time, as predicted by the Mother Superior, ill in the infirmary. When a fellow nun accused her of being a “lazybones,” Bernadette said, “My job is to be ill.” She was gradually struck by other illnesses as well as asthma: among them, tuberculosis of the lung and a tubercular tumor on her right knee. On Wednesday, April 16, 1879, her pain got much worse. Shortly after 11:00 a.m. she seemed to be almost suffocating and was carried to an armchair, where she sat with her feet on a footstool in front of a blazing fire. She died at about 3:15 in the afternoon. She was thirty-five. 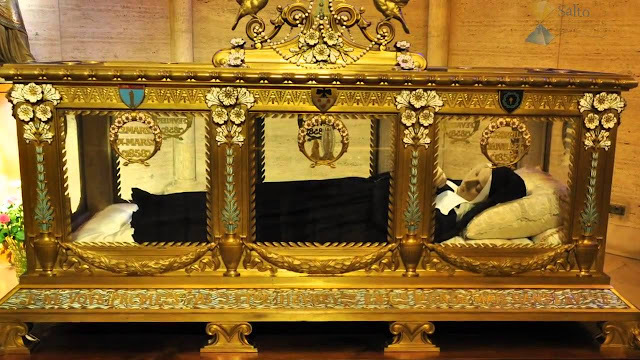 Over the course of the next 46 years, Saint Bernadette’s body was exhumed no less than three times: the first time in 1909, then again in 1919 and finally in 1925. 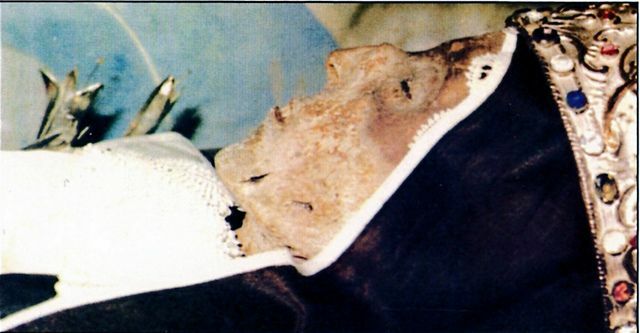 At the first exhumation, it was quickly evident that a miracle had taken place; Saint Bernadette’s skin tone was perfectly natural. The mouth was open slightly and it could be seen that the teeth were still in place. Although the rosary in her hands had decayed, showing rust and corrosion in some spots, the virginal hands that still grasped it were perfect! The sisters present thoroughly washed the body and clothed it in a new habit before placing it in an officially-sealed double casket. 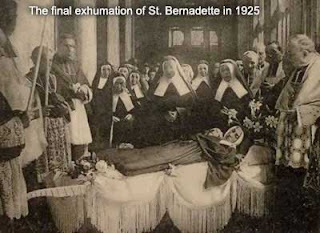 The second exhumation, in 1919, showed no further evidence of decomposition, though her hands and face had become somewhat discolored due to the well-intended washing given by the nuns ten years prior. A worker in wax was commissioned to create a light wax mask of Saint Bernadette’s hands and face. It was feared that, although the body was preserved, the blackish tinge to the face and the sunken eyes and nose would make an unpleasant impression on the public. 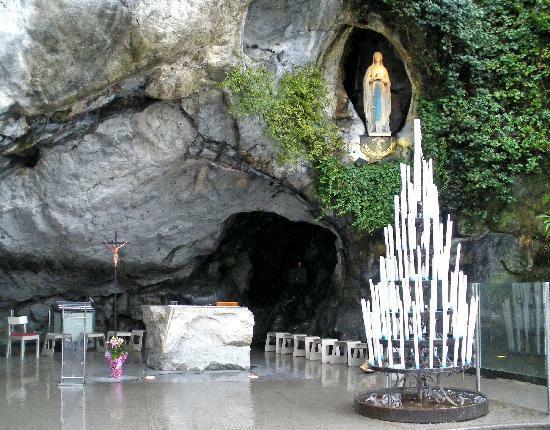 That brings us to 1946 and the final disturbing of Saint Bernadette’s resting place. One of the doctors overseeing the final exhumation, Doctor Comte, writes: "From this examination I conclude that the body of the Venerable Bernadette is intact, the skeleton is complete, the muscles have atrophied, but are well preserved; only the skin, which has shriveled, seems to have suffered from the effects of the damp in the coffin. … the body does not seem to have putrefied, nor has any decomposition of the cadaver set in, although this would be expected and normal after such a long period in a vault hollowed out of the earth." The doctor was amazed by the state of preservation of the liver: "What struck me during this examination, of course, was …the totally unexpected state of the liver after 46 years. One would have thought that this organ, which is basically soft and inclined to crumble, would have decomposed very rapidly or would have hardened to a chalky consistency. Yet it was soft and almost normal in consistency. I pointed this out to those present, remarking that this did not seem to be a natural phenomenon." Catherine Labouré died on December 31, 1876 and her body was laid to rest on January 3, 1877 in a triple lined coffin in the crypt of the chapel at Reuilly as a requirement back then for religious orders by Paris authorities. 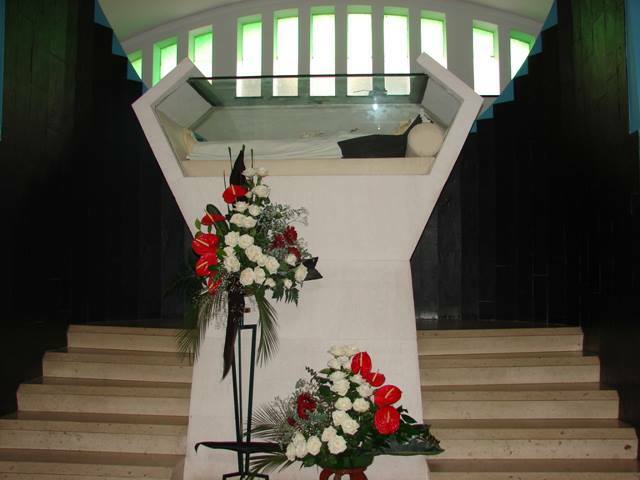 Her remains were interred there until the time of her beatification in 1933. In 1895, her Cause for Beatification was introduced in Rome. 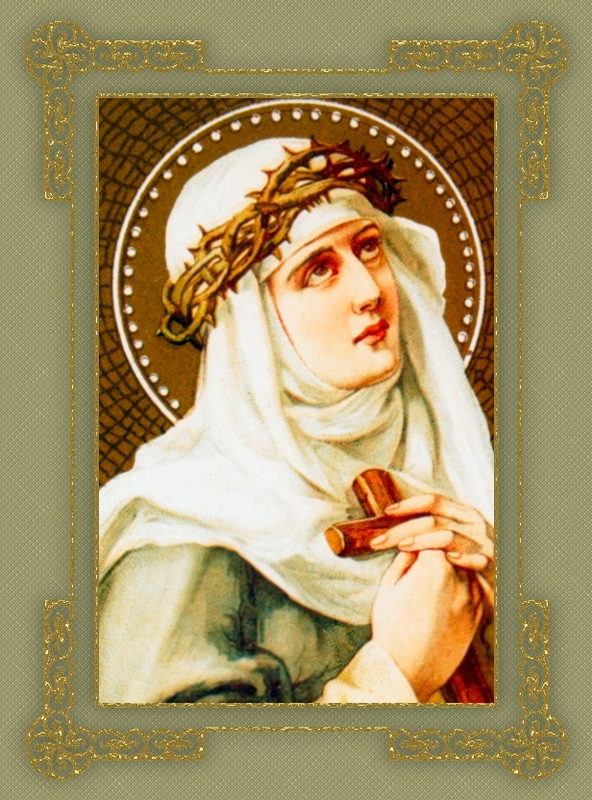 On July 19, 1931, Catherine was declared venerable by Pope Pius XI (Decree of Heroic Virtues). 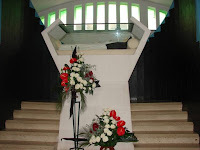 On March 21, 1933, Catherine's tomb was opened and her body was exhumed after entombed for fifty seven years. The outer wooden coffin had already disintegrated but her body miraculously remained perfectly intact seen by several eye witnesses including representatives from the Archdiocese of Paris, the Daughters of Charity, the Congregation of the Mission, and medical examiners. A detailed medical examination of Catherine's exhumed remains concluded: "The body is in perfect state of preservation, and its joints are still supple." After a detailed examination, the body was taken to the Mother House of the Daughters of Charity in Paris. 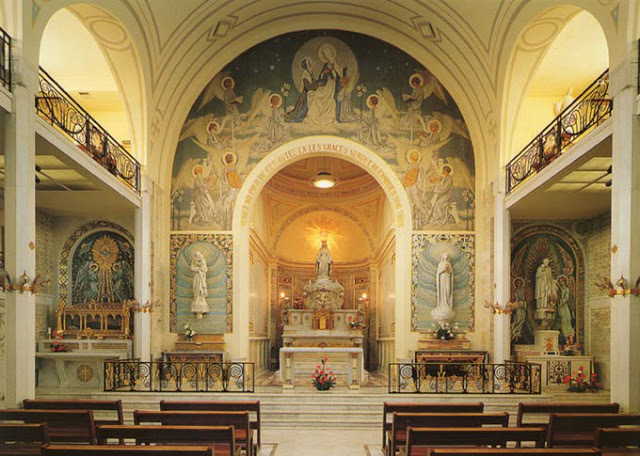 The Chapel of the Miraculous Medal in Rue de Bac in Paris, France where the incorrupt body of St. Catherine Laboure lies in the side altar shown in this photograph. Months later, on May 28, 1933, Pope Pius XI beatified Catherine. After the celebration of the beatification, the body of Catherine was placed and now lies in a glass coffin under the renovated side altar of the Chapel of Our Lady of the Miraculous Medal (often simply called by its address, 140 Rue du Bac), Paris, one of the spots of the apparition, honoring the "Virgin of the Globe" where countless pilgrims have gathered close to pray for her intercession, and that of the Blessed Virgin, and where numerous miracles were reported at her tomb. On July 27, 1947, she was canonized a saint by Pope Pius XII. The Feast Day of St. Catherine Labouré is November 28 (it was formerly celebrated on December 31). 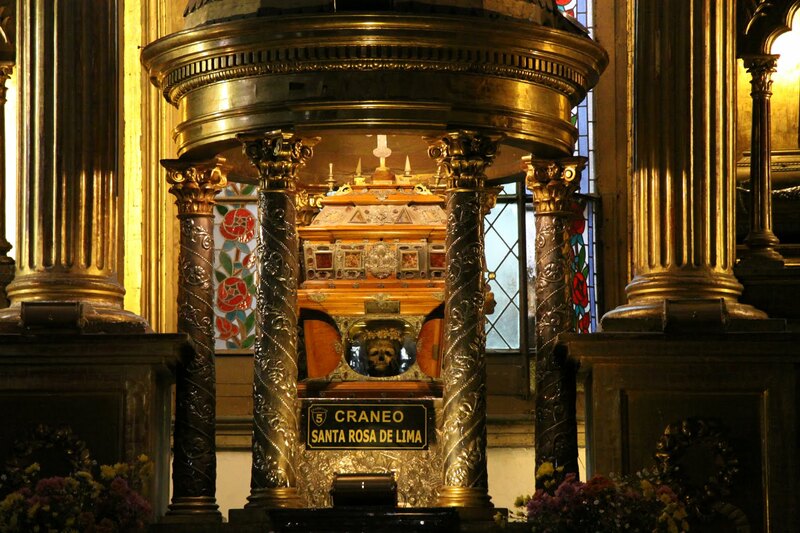 The body of Saint Rita in Cascia in the urn. St. Rita is venerated due to various miracles attributed to her intercession, and is often portrayed with a bleeding wound on her forehead, which the Roman Catholic Church claims to have been a partial stigmata. Saint Rita traveled the path of perfection, the purgative, illuminative, and unitive path of prayer. She knew suffering and grew always in charity and confidence in God. The crucifix was her greatest teacher. Upon dying in her cell the bells sounded out of joy for a soul entering into heaven. Her death, in 1457, was her triumph. The wound of the stigmata disappeared and in its place appeared a rose mark the color of a ruby, which had a beautiful fragrance. Her vigil would have been in the convent, but the crowd was so large that a church was needed. She remained there and the fragrance never disappeared. So she was never buried. The original wooden coffin was replaced by a crystal one and she has been exposed for veneration by the faithful since then. Many people still come on pilgrimage to honor the saint and to ask her intercession before her body, which remains incorrupt. she was canonized by Pope Leo XIII in 1900. 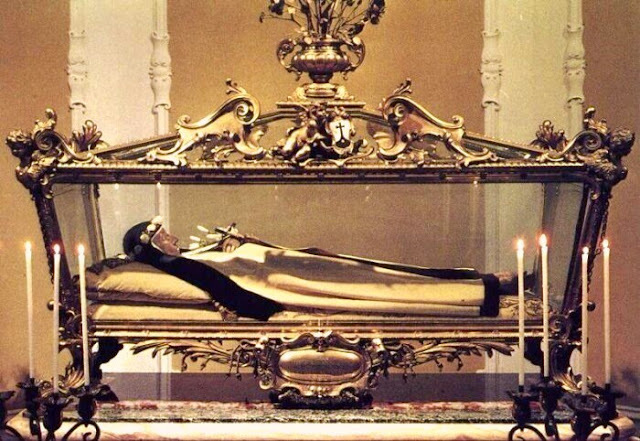 Saint Rita's tomb with her incorrupt body at the Basilica of Cascia. Veneration The "Acta" or life story of Saint Rita was compiled by the Augustinian priest, Father Jacob Carelicci. Rita was beatified under the Pontificate of Pope Urban VIII in 1626. The pope's own private personal secretary, Cardinal Fausto Poli, had been born some 15 kilometers from her birthplace and much of the impetus behind her cult is due to his enthusiasm. She was canonised on May 24, 1900 under the pontificate of Pope Leo XIII and her feast day was instituted on May 22. 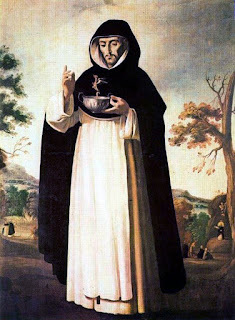 Mary of Jesus of Ágreda, OIC, also known as the Abbess of Ágreda (2 April 1602 – 24 May 1665), was a Franciscan abbess and spiritual writer, known especially for her extensive correspondence with King Philip IV of Spain and reports of her bilocation between Spain and its colonies in New Spain. She was a noted mystic of her era. A member of the Order of the Immaculate Conception, also known as Conceptionists, Mary of Jesus wrote fourteen books, including a series of revelations about the life of the Blessed Virgin Mary. 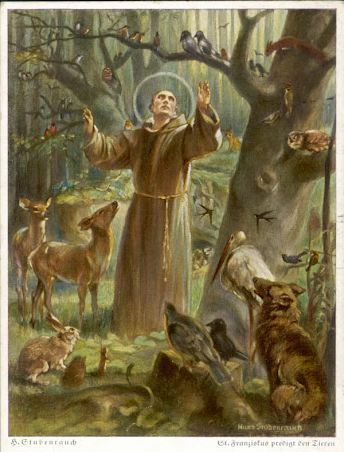 Her bilocation activity is said to have occurred between her cloistered monastery in rural Spain and the Jumano Indians of central New Mexico and West Texas, and inspired many Franciscan missionaries in the New World. In popular culture since the 17th century, she has been dubbed the Lady in Blue and the Blue Nun, after the color of her order's habit. Less than ten years after her death, Mary of Jesus was declared Venerable by Pope Clement X, in honor of her "heroic life of virtue". Although the process of beatification was opened in 1673, it has not as yet been completed. Various misinterpretations of Mary's writings led to the Mystical City of God being placed on the Church's Index Librorum Prohibitorum in August 1681, due to a faulty French translation published in 1678. The placement on the list of forbidden books proved temporary. 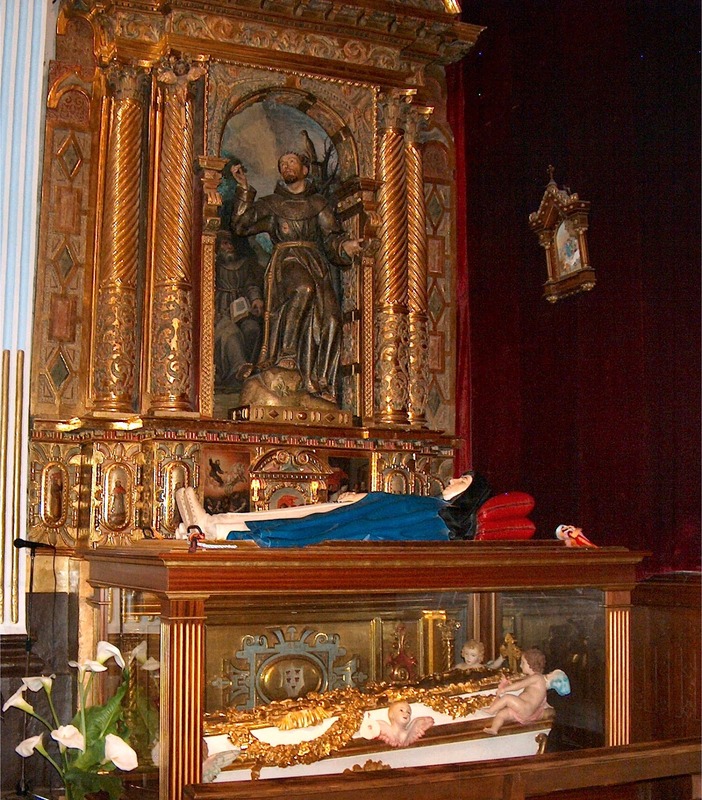 Lying below the blue recumbent statue is the incorrupt body of the Venerable María de Jesús de Ágreda in the Church of the Conceptionists Convent in Ágreda, Spain. The tradition of the apostle St James and the shrine of El Pilar, reputed to be the first church dedicated to Mary, was given by Our Lady in an apparition to Sister Mary Agreda recorded in The Mystical City of God, and is credited with instigating the rebuilding of the fire-damaged Cathedral Basilica in Zaragosa in the Baroque style in 1681 by Charles II, King of Spain, completed and rededicated in 1686. When Mary of Jesus' casket was opened in 1909, a cursory scientific examination was performed on the 17th century abbess' body. In 1989, a Spanish physician named Andreas Medina participated in another examination of the remains and told investigative journalist Javier Sierra in 1991: "What most surprised me about that case is that when we compared the state of the body, as it was described in the medical report from 1909, with how it appeared in 1989, we realized it had absolutely not deteriorated at all in the last eighty years." Investigators took photographs and other evidence before re-sealing her casket, which remains on display in the monastery church. Some consider that incorruptibility, that is, lack of normal rot and decay after death, further evidence of sanctity. Body of Saint Zita in its reliquary on display in the basilica of San Frediano in Lucca, Tuscany, Italy. Zita often said to others that devotion is false if slothful. She considered her work as an employment assigned to her by God, and as part of her penance, and obeyed her master and mistress in all things as being placed over her by God. She always rose several hours before the rest of the family and employed in prayer a considerable part of the time which others gave to sleep. 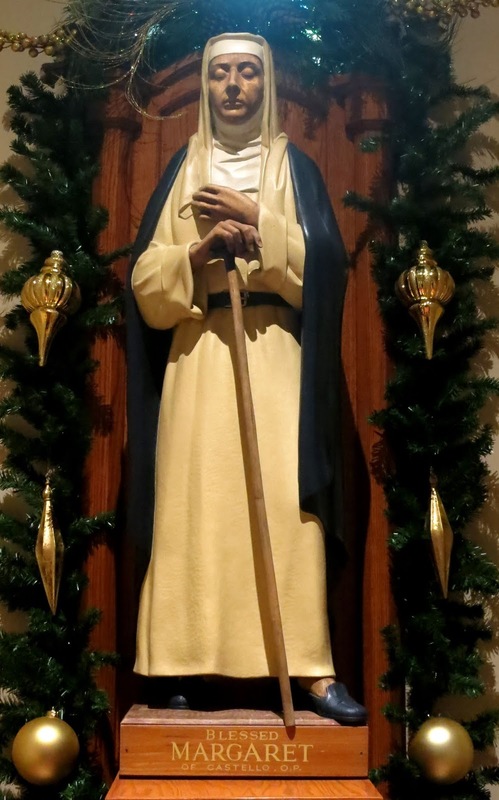 She took care to hear mass every morning with great devotion before she was called upon by the duties of her station, in which she employed the whole day, with such diligence and fidelity that she seemed to be carried to them on wings, and studied when possible to anticipate them. 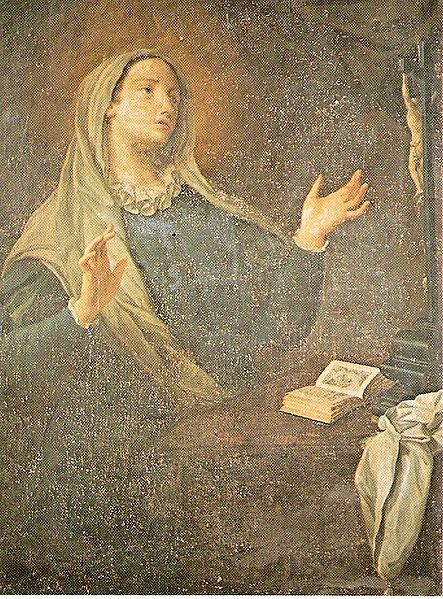 St. Benita Zita died peacefully in the Fatinelli house on April 27, 1272. It is said that a star appeared above the attic where she slept at the moment of her death. She was 60 years old, and had served and edified the family for 48 years. By her death, she was practically venerated by the family. 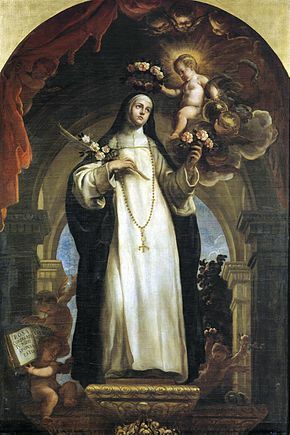 After one hundred and fifty miracles wrought in the behalf of such as had recourse to her intercession were juridically proven, she was canonized in 1696. 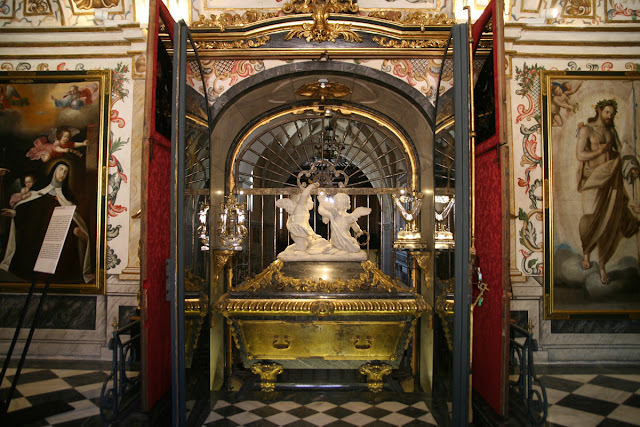 Her body was exhumed in 1580, discovered to be incorrupt, but has since become mummified. St. Zita's body is currently on display for public veneration in the Basilica di San Frediano in Lucca. Her feast day in the Catholic Church is April 27. The curious and bold who venture past the nondescript doors are treated to a rare site among saintly relics – the incorrupt body of St. Catherine of Bologna sitting uniquely upright on a golden throne encased in glass. The physical remains of Saint Catherine still baffle scientists who even until today cannot explain why, after more than 500 years, her body has retained a level of flexibility attributed to that of a living person. Wearing a Poor Clare’s habit, her skin is tight with time and dark with centuries of candle soot from those beseeching her intercession through the ages. Regally she sits with her similarly blackened hands tenderly clutching a golden cross and aged Bible. Having died and been buried without a casket in 1463 at the age of 50, the sweet odor of sanctity began emanating almost immediately from the humble saint’s grave followed by miraculous cures for those who sought her assistance. Just 18 days after her burial, Catherine’s body was exhumed and found to be completely incorrupt. 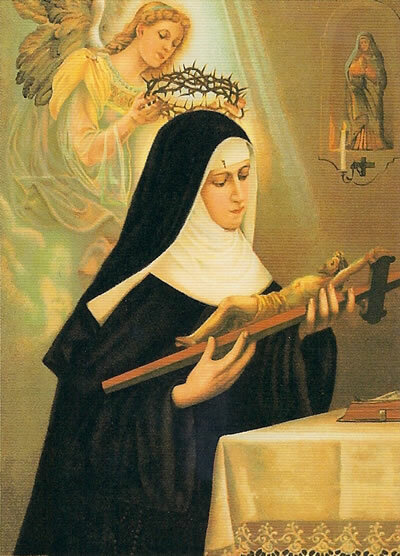 Since her canonization in 1712 by Pope Clement XI, innumerable miracles have been attributed to her among those devoted to her powerful intercession. 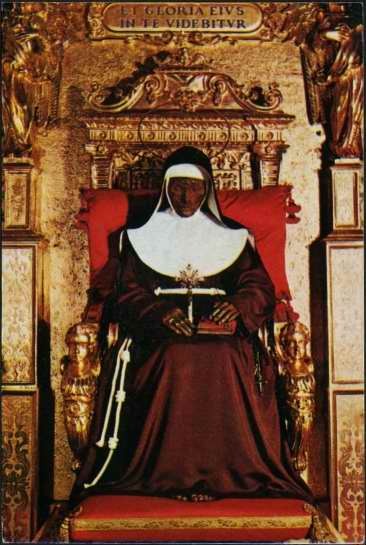 It has been recorded that after her death, she appeared to a nun at her convent and requested that her body be placed in a sitting position. One cannot help but wonder why this particular request was made! Perhaps it is because this is how Catherine spent much of her life, sitting as she did with her sisters, instructing them, and now us, in the ways of sanctity. Perhaps it is also her way of reminding us that she and all the Heavenly Court are very much present with us today, particularly as we fight the battles of our own lives and times. Her posture as a sitting Saint also seems to invite us to continue to seek her intercession, laying our troubles in her capable lap. The piety and humility she possessed inspired many to follow her in her day. Always spiritually upright, like Catherine, let us also resolve to live as she did – applying her seven weapons for spiritual warfare in our own lives and never letting go of the Lord’s hand even during our darkest, most challenging moments. At the age of 49, Agnes’s health began to fail rapidly. She was taken for treatment to the baths at Chianciano–accompanied, as it says in the rule, by ‘two or three sisters’–but the baths did her no good. She did perform a miracle while there, restoring to life a child who had fallen into the baths and drowned. Agnes returned to Montepulciano to die in the night. When she knew she was dying after a long and painful illness, Agnes told her grieving nuns that they should rejoice, for, she said, “You will discover that I have not abandoned you. 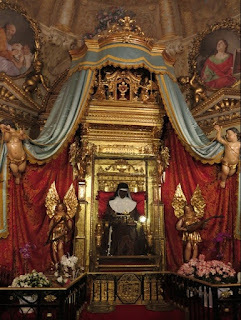 You will possess me for ever.” The children of the city wakened and cried out, “Holy Sister Agnes is dead!” She was buried in Montepulciano, where her tomb soon became a place of pilgrimage. 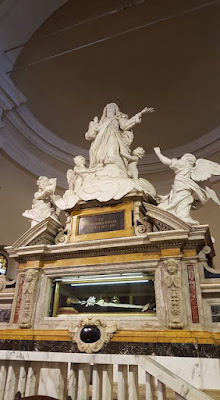 One of the most famous pilgrims to visit her tomb was Saint Catherine of Siena, who went to venerate the saint and also, probably, to visit her niece, Eugenia, who was a nun in the convent there. As she bent over the body of Saint Agnes to kiss the foot, she was amazed to see Agnes raise her foot so that Catherine did not have to stoop so far! 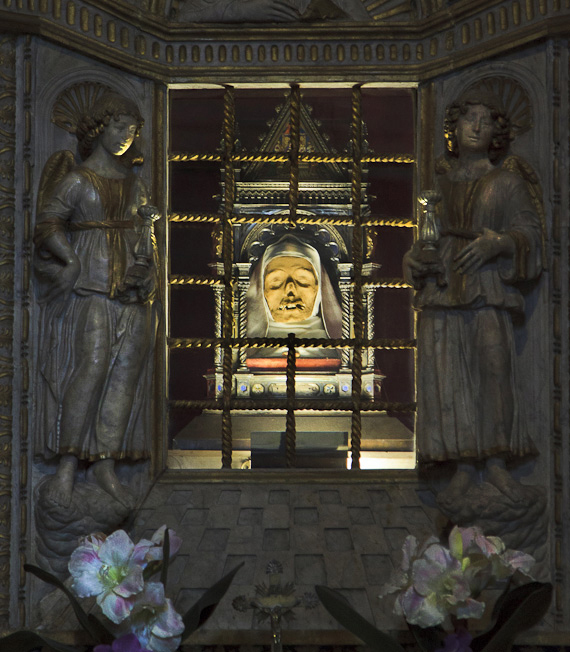 In 1435, her incorrupt body was translated to the Dominican church at Orvieto, where it remains today. Clement VIII approved her office for the use of the order of St. Dominic, and inserted her name in the Roman Martyrology. Died: at Montepulciano, Tuscany, on April 20, 1317. 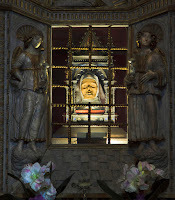 Legend says that at the moment of her death, all the babies in the region, no matter how young, began to speak of Agnes, her piety, and her passing; miracles reported at her tomb; body incorrupt; relics translated to the Dominican church at Orvieto in 1435. Saint Teresa of Ávila, also called Saint Teresa of Jesus, baptized as Teresa Sánchez de Cepeda y Ahumada (28 March 1515 – 4 October 1582), was a prominent Spanish mystic, Roman Catholic saint, Carmelite nun, author, and theologian of contemplative life through mental prayer. 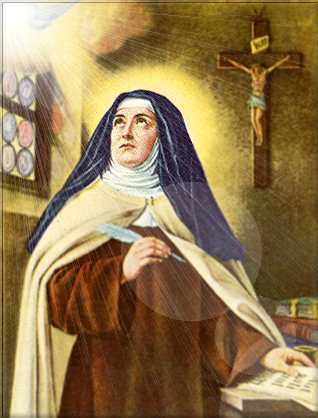 Active during the Counter-Reformation, she was a reformer in the Carmelite Order of her time; the movement she initiated, later joined by Saint John of the Cross, eventually led to the establishment of the Discalced Carmelites, though neither she nor John were alive when the two orders separated. coffin caved in due to the extreme weight of stone and rubble. A remarkable occurrence began to take place at her grave; an unexplainably sweet fragrance permeated the area. This phenomenon continued to the point that on July 4, 1583, nine months after her death, her body was exhumed (another seemingly strange European custom). When the coffin was lifted from the ground, it was found that the lid had indeed been smashed. It was also found that the lid was half rotten and full of an odorous mildew. Teresa’s body was found to be as fresh and supple as the day of her burial. Given the conditions of her coffin and the lack of embalming, there is no scientific explanation as to why her body should not have been badly decomposed. What is even more fascinating, her body, last exhumed in 1914 was still incorrupt. Broken in health, Teresa died during one of her visitations to the convent of Alba de Tormes at the age of 67 on October 4, 1582. Immediately, her heart was surgically removed from her body. Although this may seem very strange to us, it has been for hundreds of years, a custom in Europe to always secure relics. Upon examination, her heart, which had been pierced in 1559, had been found with a deep mark in the form of a scar. The following day, she was buried with full solemnity. There was a fear that due to Teresa’s popularity, someone might actually attempt to steal her body from her grave, thus an extra amount of dirt and rubble was ordered over her coffin in order to ensure the body’s safety. Unfortunately, the lid to the coffin caved in due to the extreme weight of stone and rubble. A remarkable occurrence began to take place at her grave; an unexplainably sweet fragrance permeated the area. This phenomenon continued to the point that on July 4, 1583, nine months after her death, her body was exhumed (another seemingly strange European custom). When the coffin was lifted from the ground, it was found that the lid had indeed been smashed. It was also found that the lid was half rotten and full of an odorous mildew. Teresa’s body was found to be as fresh and supple as the day of her burial. Given the conditions of her coffin and the lack of embalming, there is no scientific explanation as to why her body should not have been badly decomposed. What is even more fascinating, her body, last exhumed in 1914 was still incorrupt. 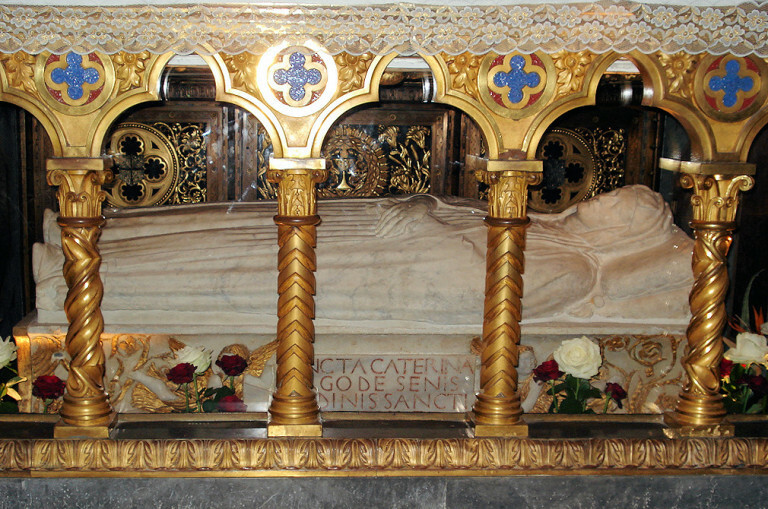 Her incorrupt body, which is above the main altar, in Alba de Tormes. Despite all her illnesses, which she endured her entire life. the body of St. Teresa, remained as white and smooth as alabaster, like that of a child of three. All the wrinkles that had gathered since her illness had vanished. sweet smell which nobody could describe or identify came from the body and everything that had touched it — towels, garments, even St. Teresa 's fingerprints on a plate. It became so overpowering in the cell where she died that the windows had to be opened to prevent head- aches and fainting. after her death, and each time the body was found incorrupt, firm, and sweet-smelling. Her heart, hands, right foot, right arm, left eye and part of her jaw are on display in various sites around the world. Teresa Margaret had attempted all her life to remain hidden. In many ways she succeeded. But upon her death, the veil over her exalted sanctity was lifted by God Himself. The condition of Teresa Margaret’s body was such that the nuns feared it would decay before proper funeral rites could be accomplished. Her face was discolored, her extremities were black, the body already bloated and stiff. When her body was prepared and laid out in the choir later in the day, it was almost unrecognizable to the sisters who had lived with her for the last five years. Her funeral was held the following day and plans were made for her immediate burial. When she was moved into the vault however, everyone noticed that a change had taken place in the body. The blue-black discoloration of her face was much less noticeable. The community decided to postpone the burial. A few hours later a second examination showed that the entire body had regained its natural color. The nuns were consoled to see the lovely face of Teresa Margaret looking just as they had known her. They begged the Provincial’s permission to leave her unburied until the next day, a request which he, dumbfounded at this astonishing reversal of natural processes, readily granted. The final burial of the body was arranged for the evening of the 9th of March, fifty-two hours after her death. By that time her skin tint was as natural as when alive and in full health, and the limbs, which had been so rigid that dressing her in the habit had been a difficult task, were flexible and could now be moved with ease. This was all so unprecedented that the coffin was permitted to remain open. The nuns, the Provincial, several priests and doctors all saw and testified to the fact that the body was as lifelike as if she were sleeping, and there was not the least visible evidence of corruption or decay. Her face regained its healthy appearance; there was color in her cheeks. Mother Victoria, who had received the profession of this young nun, suggested that a portrait should be painted before the eventual burial. This was unanimously agreed to, and Anna Piattoli, a portrait painter of Florence, was taken down to the crypt to capture forever the features that now in death looked totally life-like. The Carmel burial vault was a scene of much coming and going during these days, and had assumed anything but a mournful atmosphere. By the time the painting was completed, a strange fragrance was detected about the crypt. The flowers that still remained near the bier had withered. But the fragrance persisted, and grew in strength, pervading the whole chamber. And then, miles away in Arezzo her mother Camilla also became aware of an elusive perfume which noticeably clung to certain parts of the house. Teresa Margaret was finally buried eighteen days after her death. The report of miracles attributed to her intercession began immediately. 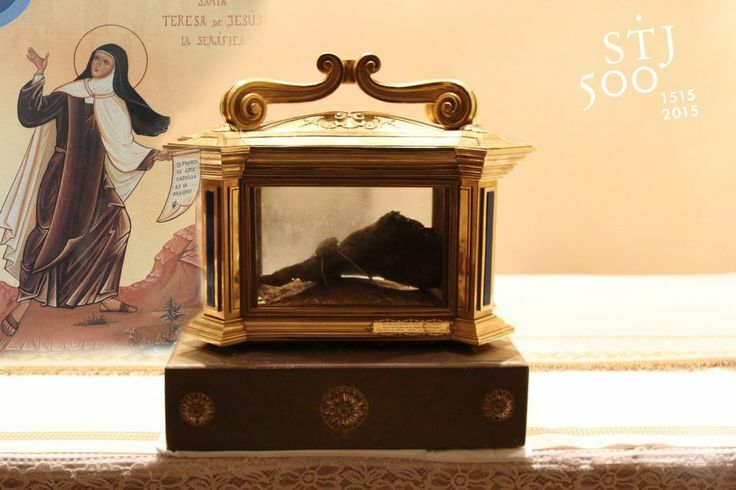 Thirty-five years later, on June 21, 1805, the Feast of the Sacred Heart, the incorrupt body of St. Teresa Margaret was transferred to the nuns’ choir in the Carmel of Florence where it remains to this day. 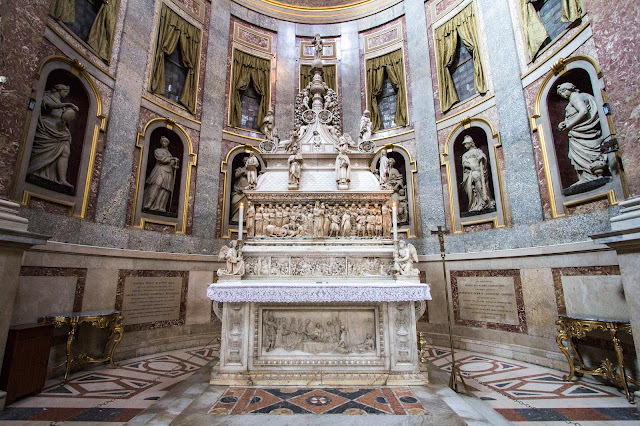 Sarcophagus of St. Catherine beneath the High Altar of Santa Maria sopra Minerva, Rome. 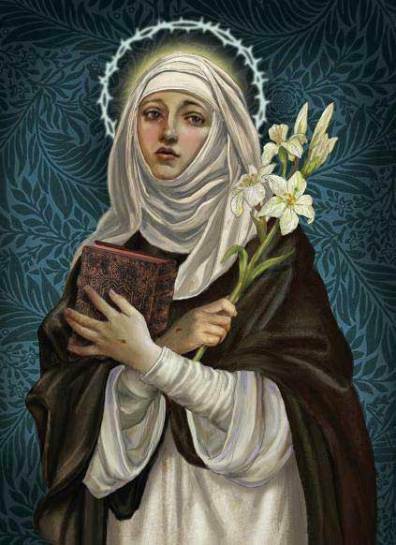 Saint Catherine of Siena TOSD (25 March 1347 – 29 April 1380), was a tertiary of the Dominican Order and a Scholastic philosopher and theologian who had a great influence on the Catholic Church. She is declared a saint and a doctor of the Church. In 1380 her health began to fail and Catherine prayed to join Christ. She could scarcely swallow due to severe inflammation in her throat. On Sexagesima Sunday, she suffered a violent stroke, followed by another one the next evening. Nonetheless, she rose every day during most of Lent and walked a mile to St. Peter's, where she prayed all day. Finally, overcome, she lay in bed for eight weeks, covered with sores and unable to lift her head. Her body wasted away. In her final hours, she rallied to berate herself for her imperfections and sins, and to pray for the Church, the pope and others. She asked for, and received, plenary indulgence to be absolved Of all her sins, saying it had been granted to her by Popes Gregory and Urban. Catherine died at age 33 on April 29, the Sunday before the Ascension. Her body was displayed for three days and remained intact, flexible and fragrant. Huge crowds came to touch her corpse. ↷ A shoulder blade taken in 1575 for the Dominican Sisters of Magnanapoli in Rome; two reliquaries of bone and skin taken in 1853 for St. Dominic in Stone, England, and the convent of St. Catherine in Bow, England. 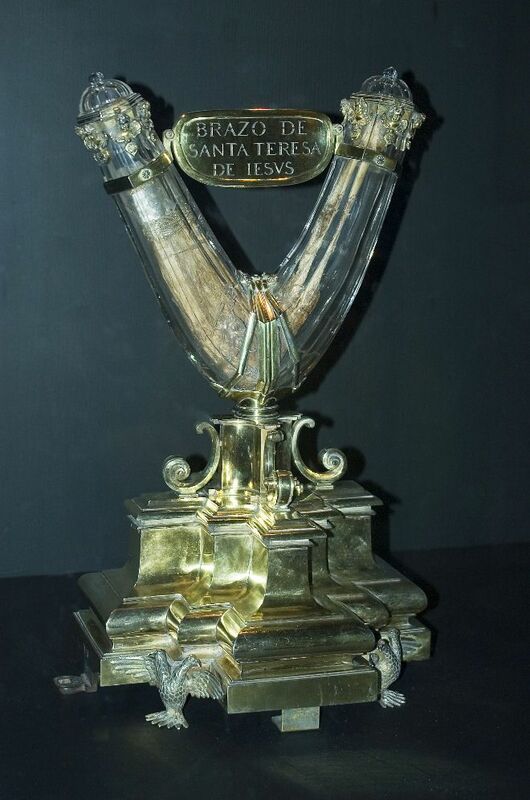 The finger that bore the mystical ring of Christ was given to the Chartreuse of Pontiniano near Florence. Other small relics were distributed as well. On August 4, 1855, the sarcophagus of Catherine was placed below the main altar of the Church of Santa Maria sopra Minerva. This event is known as the Translation Of the Relics of St. Catherine, which feast is commemorated on the Thursday after Sexagesima Sunday. The Feast of her Espousals is kept on the Thursday of the carnival. 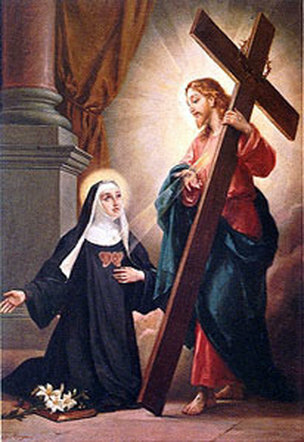 When Clare was on her deathbed in 1308, she repeatedly said, "Know that in my very heart I have and hold Christ crucified." Soon after her death, her sisters were inspired to take out her heart. When they did so, a quantity of blood rushed out and was collected in a vial that had been washed and purified. ↷ A thumb-sized crucifix. The body of Christ was white and his lance wound red, and his loins were covered in white tissue. In addition, three mysterious pellets were found in thc gall. The pellets were about the size of hazelnuts, and were judged by theologians to be symbols of the Trinity. Any one of them was as heavy as the other two, while at other times any one Of them equaled the weight Of all three together. The sisters locked the heart and vial of blood in a box. The next day these items were examined by a group of officials who included the chief magistrate, the leading doctor in the town and a public notary, with a representative of the Franciscan house at Foligno in attendance. More examinations were conducted later by other Church officials and politicians. Clares body and heart remained incorrupt. At various times the blood was seen to liquefy and also to boil and bubble. These episodes seemed to presage political disturbances and turmoil. Liquefactions were recorded in 1495, 1500, 1508, 1560, 1570, 1601, 1608 and 1618. 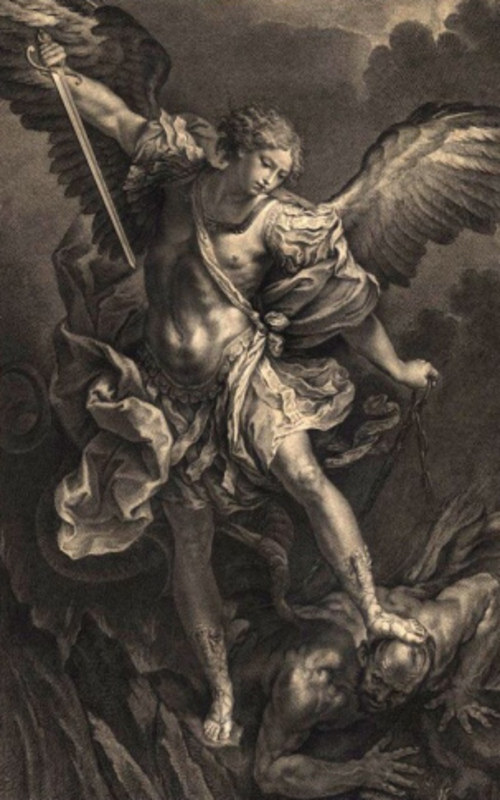 In the 17th century a commission was established to investigate the mystery of the blood, and con- eluded that no natural explanation could be found. In 1608 the body was moved from its shrine. The blood in the vial had dried and coagulated. The vial was dropped and everything broke into pieces. All the pieces were collected and placed in a crystal vessel. Over time this vessel cracked and was placed in a third vessel. The incorrupt body of Clare can be viewed at the Santuario S. Chiara da Montefalco. Her incorrupt heart is enclosed in a bust and can be viewed under a crystal. The pellets are in a jeweled cross kept in the Church 01 the Holy Cross in Montefalco. In 1964, Sister Mary of the Divine Heart, the countess of Droste zu Vischering, officially received the title of Venerable by the Catholic Church. On November 1, 1975, she was declared blessed by Pope Paul VI. Doctor Waldery Hilgeman is the Postulator of the cause of canonization. The holy death of Blessed Margaret of Castello occurred on April 13, 1320, when she was thirty-three years of age. The people of the city blocked the funeral procession out of the church, demanding that she be buried in the church because of her well-known reputation for sanctity. A small crippled child who had never walked was brought to her coffin inside the church. Immediately she was healed completely, and began to walk for the first time. After her death, more than two hundred miracles occurred in confirmation of her heroic sanctity and upon exhumation, her body was discovered to be incorrupt. After the exhumation, Bl. Margaret's body was re-clothed in a fresh habit and was placed in a new coffin. Many miracles followed this ceremony. Her cause for beatification, which was undertaken with renewed interest, came to a successful conclusion on October 19, 1609. Pope Paul V officially recognized Margaret’s sanctity, pronouncing her a beata and designating April 13 as her feast day. Her cause for canonization is still pending. Today many invoke Bl. Margaret of Castello as a patroness in the battle against abortion. Like so many children today, she was 'unwanted' by her parents. Had she been conceived in our day and age, when abortion is held as legal in nearly every corner of the world, she would almost surely have been murdered in utero or as an infant. The world would have been deprived of a great heroine and inspiration. She is a striking witness to the truth that God's ways are not man's ways (cf. Is 55:8) and that God exalts the lowly and humble (cf. Lk 1:52). 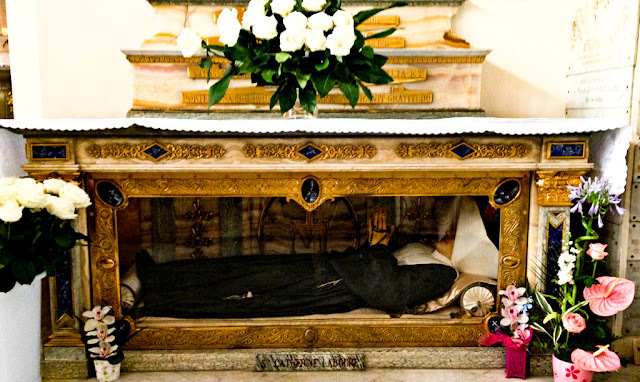 The body of Blessed Margaret, which has never been embalmed, is dressed in a Dominican habit, and lies under the high altar of the Church of St. Domenico at Citta-di-Castello, Italy. The arms of the body are still flexible, the eyelashes are present, and the nails are in place on the hands and feet. The coloring of the body has darkened slightly and the skin is dry and somewhat hardened, but by all standards the preservation can be considered a remarkable condition, having endured for almost seven hundred years. Saint Catherine of Genoa (Caterina Fieschi Adorno, 1447 – 15 September 1510) was an Italian Roman Catholic saint and mystic, admired for her work among the sick and the poor and remembered because of various writings describing both these actions and her mystical experiences. She was a member of the noble Fieschi family, and spent most of her life and her means serving the sick, especially during the plague which ravaged Genoa in 1497 and 1501. She died in that city in 1510. Beginning around 1491, Catherine began to suffer from a mysterious malady that doctors did not know how to treat. It did not seem to be either physical or spiritual; it left her greatly debilitated. In 1493, Catherine nearly died of the plague. She recovered, but remained permanently weakened. Catherine followed her own inner guidance and would not submit to the spiritual direction of anyone else. She often told others that she could not put into words what she experienced. In 1495 a Father Marabotti became her spiritual adviser, and helped her to compile her memoirs in her Life and Doctrine. In 1509 her food intake, which had never been good, declined drastically; she ate in a week what most people would cat in a day. That soon dropped to nothing more than small quantities of broth. Nonetheless, Catherine attracted many visitors, who saw perfection in her. She touched others with her "burning words of divine love." But as her strength ebbed, she was able to utter only phrases and words, such as "Love of God" and "charity, union and peace," and finally just "God." She suffered violent attacks in which she would seem to writhe as if in flames of fire, and would cease breathing. She felt her heart wounded with a new ray of divine love, which caused more severe bodily pain. On January 10, 1510, she lost sight and speech, and made signs to be given last rites. She recovered her senses but continued to suffer in agony. By May doctors said they could do nothing for her and that her affliction was "supernatural." Her last months were spent in excruciating pain. She could not tolerate taking any food or liquid. On September 12, black blood flowed from her mouth and her body was covered with black stripes. She bled violently again on September 14. That evening, she indicated she would Lake her Communion in heaven. She died uttering, "Into thy hands, O Lord, I commend my spirit." She was seen by several persons ascending to heaven clothed in white and on a white cloud. Catherines body was interred in the hospital of the Pammatone, the largest hospital in Genoa, where she had done much of her work. It was disinterred nearly a year later when it was discovered that a conduit of water ran behind the tomb. Though the wood coffin was decayed and filled with worms, the body was untouched and incorrupt, and appeared to have been dried out. Her body was put on public display for eight days, and pilgrims claimed to be cured. Prior to her death, Catherine had instructed that her heart be examined after death to see if it had been consumed by divine love, but this was not done. The body was placed into a marble sepulcher in the hospital. It was moved to various locations in 1551, 1593 and 1642. 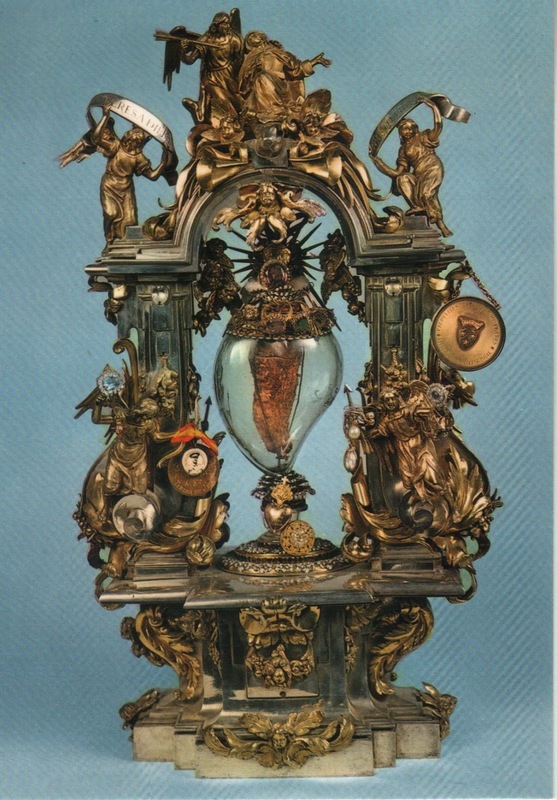 In 1694 it was moved to a glass-sided reliquary placed high on an altar in a church built in her honor in the quarter of Portoria, Genova. Catherines body was examined by physicians in 1834 and on May 10, 1960. Though brown, dry and rigid, her relic was determined to be free or embalming or any treatment [or preservation. 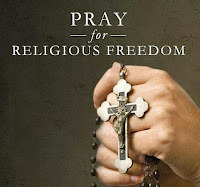 Catherine wrote Spiritual Dialogue between the Soul, the Body, Sew-Love, the Spirit, Humanity and lhc Lord God and Treatise on Purgatory, two mystical works that proved her sanctity for canonization and remain respected today. In her writings, Catherine exhorts people to seek nothing less than complete union with God. Without the grace of God, she said, man is nothing more than the devil. She said the human intellect could not comprehend the true nature of pure love, which is incapable of suffering. St. Louis Bertrand is believed to be a relative of St. Vincent Ferrer. On the day of his birth, he was baptized in the same font in which Vincent Ferrer was baptized 150 years before him. 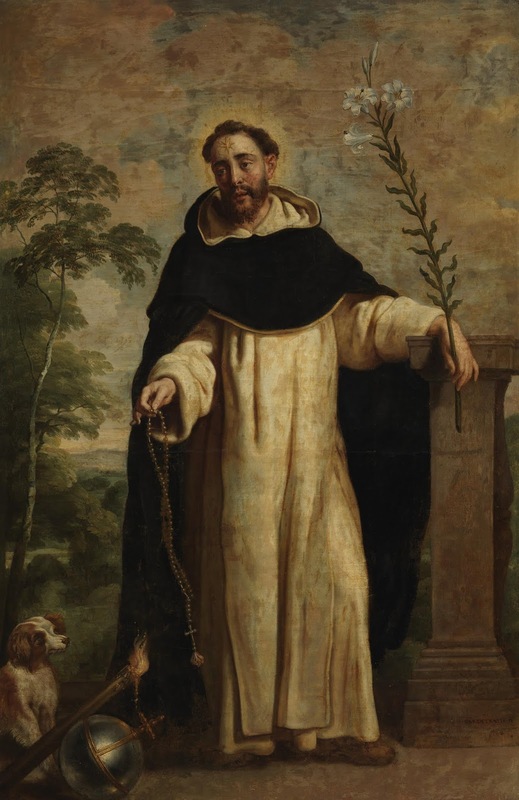 He was received into the Dominican order at the age of 19 and was ordained before he was 22. He filled many offices within the order, most notably, that of master of novices. By the practice of outstanding virtue, self-denial and penance, he furnished for the novices a perfect model for their imitation. In 1562 he was sent to work among the Indians in the northwestern part of South America. During the seven years he was there, working with many different tribes, he was favored with the gift of tongues. His preaching was accompanied by many miracles and prophecies. He once raised a girl to life by the application of a rosary. He attributed to Our Lady all the miracles manifested through him. 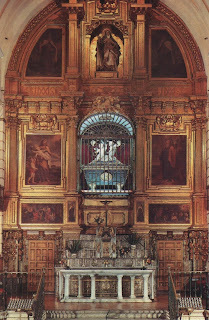 After returning to his native Valencia, he occupied administrative posts within the order, and won the esteem and friendship of St. Teresa of Avila. After a long and painful illness, he died at age 55. During the process of his beatification, witnesses testified that shortly after his death a heavenly perfume arose from his body. Moreover, a light which glowed for several minutes proceeded from his mouth and illuminated his whole cell. And before his funeral, seraphic music was heard in the church. The body of St. Louis Bertrand, which remained incorrupt for over 350 years, was maliciously destroyed during the Spanish Revolution of 1936. St. Catherine de Ricci and St. Louis Bertrand were contemporaries. She left behind a patrician lineage to enter the Dominican convent at Prato, Italy, when she was 13. Born Alexandrina of Ricci, she was given the name Catherine at her profession, and with her new name, she embraced a life of severe penances, but one also distinguished by unusual mystical experiences. She endured many physical afflictions, which seemed to be aggravated by ordinary medical treatment. During Holy Week of 1542, when Catherine was 20, she experienced the first of her ecstasies, in which she saw enacted, in sequence, the scenes of Our Lord’s passion. These ecstasies were repeated every week for twelve years. They began at midday every Thursday and ended on Friday at 4:00. 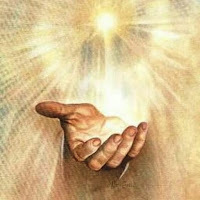 On Easter Sunday of her twentieth year, Our Lord appeared to her, took a ring from His finger, and placed it on the forefinger of Catherine’s left hand as a symbol of their mystical espousal. She would also be given His stigmata and bore the wounds of Jesus in her hands, feet, side, and on her head, those of His crown of thorns. Another mystical phenomenon attributed to Catherine were her conversations with St. Philip Neri while he was in Rome and she, in her convent at Prato. While they had exchanged a number of letters, they had never met, except through their mystical visits. Five reputable people testified that they had witnessed these meetings of the saints. Even though it seems that Catherine’s life was preoccupied with the mystical, she also held positions of authority in her community. While still very young, she was selected as novice mistress and then sub-prioress. Later, at the age of 38, she was appointed prioress in perpetuity. She is said to have been happiest when working among the poor and sick of the city. After a lengthy illness, Catherine died on the feast of the Purification of the Blessed Mother, February 2, 1590, at age 68. She was canonized in 1747. The Basilica of Prato possess the incorrupt remains of the saint who has been designated the patroness of the city. 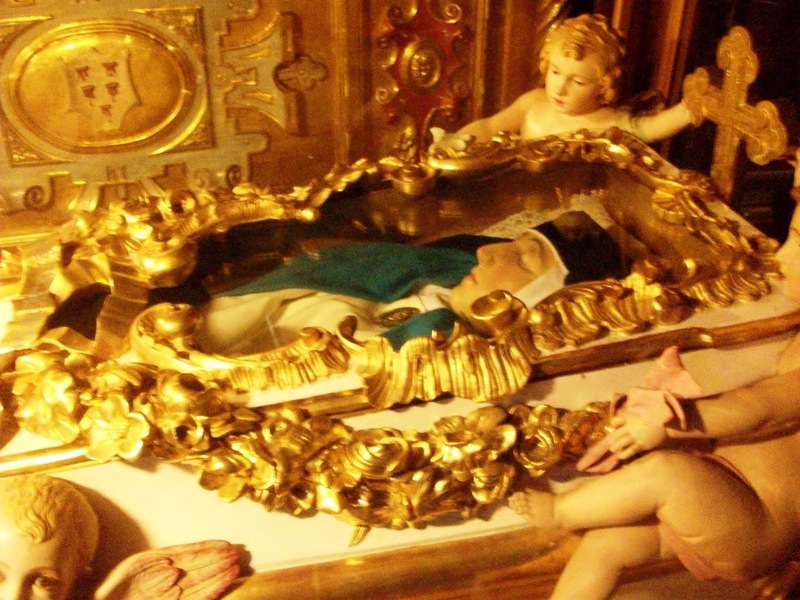 The darkened but still beautiful relic of St. Catherine lies in an ornate reliquary which is exposed for public veneration below the major altar of the basilica. From childhood St. Rose undertook fasts, performed penances, and was favored with many visions and mystical experiences. Her parents prevented her from embracing the cloistered life, but she found consolation in the little hermitage which she had built in the garden of her home. 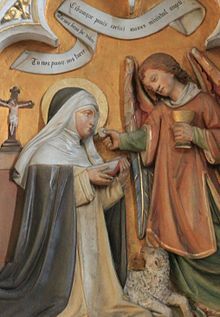 At the age of 23, Rose joined the Third Order of St. Dominic, took St. Catherine of Siena as her patroness, and increased her fasts and mortifications. She worked to help her parents, yet set aside a room in her house where she helped destitute children and the elderly. Her prayers were credited with saving Lima from an invasion of pirates. But despite all this, she was once brought to the attention of the Inquisition. St. Rose died on the day she had predicted, but it was impossible to hold her funeral for several days, owing to the crowds of mourners. Her body was buried in the cloister of St. Dominic’s Church where it was found entire, fresh, and fragrant eighteen months later. However, in 1630, thirteen years after her death, her body was found somewhat wasted and desiccated. Domingo, there is a special altar dedicated to the Peruvian saints, on which rest three golden chests containing the skulls of St. Rose and St. Martin de Porres, and the remains of Blessed John Macias. The rest of her relics are kept a few blocks away in the small church which was built on the very grounds on which Rose lived. This basilica also houses many of the objects which the saint wore or used during life. 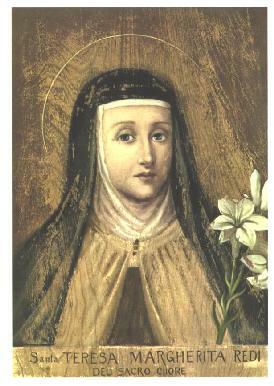 St. Rose was canonized by Clement X in 1671. She was promptly proclaimed the patroness of Peru, the Indies, the Philippines, and of all America.